While the iPhone is capable to click great pictures with its powerful camera designed by some of the most experienced camera manufacturers with a tap on its screen, there’s a wide range of accessories and add-ons that can be used to take your photography experience to the next level. 1.Gorillapod – the beast Tripod. When you embark on a trip dedicated to photography, there is one tool that you never forget to carry with you – The Tripod. From the priciest DSLRs to the most powerful GoPro cameras, a photographer’s life would come to a dead-end without this beautiful piece of invention. And the same goes for the iPhone. A tripod can be used to capture time lapse, slow motion videos, or simply pictures that require a group attendance. We recommend our users to put their hands on the Gorillapod, a 3-legged Tripod with a bendy structure. This tool will help you in placing and further adjusting your iPhone to give angles and views that are usually difficult to achieve. And due to its sturdy and easy-to-manipulate structure, you can mount it practically anywhere. Quite often we bump into situations where we wish we had a time machine to get the perfect shot. Most users make use of the self-timer mode to get pictures that require time (usually a few seconds) to adjust the portrait. But the self-timer mode has its own limitations. To break this dilemma, you can use the volume buttons in the latest EarPods released by iPhone to master control the camera’s shutter. And you thought this hearing device by Apple was overpriced! All you have to do is to setup you phone at the perfect angle and press the volume ‘+’ button to click the picture. The only drawback being the short range that is allowed by the EarPod.It’s time you load your phone with some of the featured iPhone accessories.You can check out OZCodes.com for lucrative discount offers to get the best iPhone photography accessories for less. Ever wondered why your videos are filled with sudden shakes and abrupt movements while most people are able to create video content without the slightest of jerks? Well, the magic lies in using a camera stabilizer. If you are on a trekking mission or a road trip that involves continuous vibrations and jumps, then the Gimbal System stabilizer by Osmo Mobile should be your number one choice. It will give you a video smoothness that is common to professional movie makers and famous YouTubers. It has a built-in active track control for targeted subjects, live streaming features and an array of other features in a single package. Speaking of magic, mobile printers still exist. Yes! The Polaroid photo printer by Polaroid ZIP can provide you instant photo printouts with a sticky back part if you are planning to use it on walls and similar surfaces. With the help of the special ZINK (Zero ink) technology, you are looking at a printer with does away with the conventional ink cartridges. The machine is battery powered and is pretty straight forward to use, thanks to the Polaroid Zip App which is easily available on the iPhone’s App store. The standard print size is 2 inches by 3 inches and has an inbuilt image enhancer to which optimizes the picture quality automatically. You can hook it up to your iPhone via Bluetooth connectivity. One thing that all iPhone users dread the most is the battery drainage issue. And if you are a photography enthusiast, then it’s highly likely that your battery has suffered irreversible damage due to constant overcharging. The most common reason for battery discharge in photography applications is the use of the phone’s flashlight during low-light conditions. We recommend our users to opt for a portable spotlight that fits right on top of an iPhone’s upper edge and gives a stadium lit flood light experience. The spotlight by Photojojo comes with a variety of luminosity setting which can be adjusted to suit your creativity. Yes, you heard that right. Adjusting lenses was once thought to be a part of DSLR photography only. 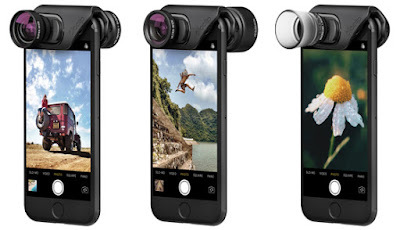 But the award winning Olloclip lens manufacturers have a team of Engineers dedicated to designing the best add-on lenses for iPhone. It’s latest ‘Connect’ series for iPhone 7 and 7 plus boasts of a single clip feature that allows all of its lenses to be mounted on the phone at the same time. With features like the fish eye, macro lenses and wide angle already popular in its preceding models, one can expect sheer brilliance and edge to edge clarity from Olloclip.